A Crisis for the Rich as well as the Middle Class & the Poor! Benjamin Franklin, January 17, 1706 – April 17, 1790, one of our Founding Fathers; printer, author, inventor, scientist, politician & theorist, postmaster, statesman, & diplomat. Excuse us for living, but many of us recall our history lesson about Ben Franklin’s warning. You probably know Franklin’s famous quote. The Constitutional Convention had just concluded its work at Independence Hall in Philadelphia, September 18, 1787. 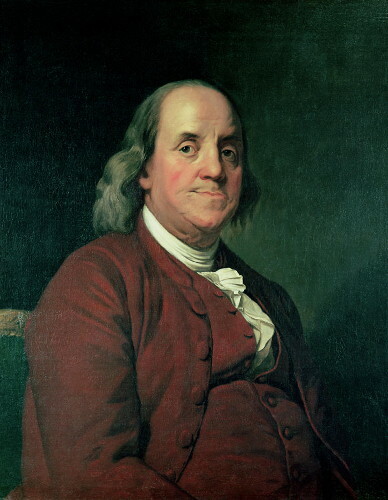 A Mrs. Powell asked Ben Franklin, “Well, Doctor, what have we got, a republic or a monarchy?” Franklin wisely responded, “A republic, madam, if you can keep it.” And so, once again in our nation’s history, it is time to make some adjustments to live up to Ben Franklin’s admonition. 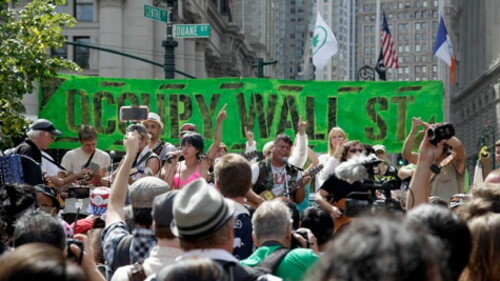 It began as “Occupy Wall Street” in New York City’s Zucotti Park, September 17, 2011. Quickly it spread by October 9 to Occupy protests in over 95 cities & 82 countries. From 1979 to 2007, the top 1 % increased their income 275%, while 60% of middle class income gained just short of 40%. By 2007, the top 1 % accounted for 24% of all income. As of 2011, in terms of overall wealth, as opposed to income, the top 1% controlled 40% of all wealth. In 2012, the income gap between the richest 1% & the remaining 99% was the widest since the 1920’s, with the 1% gaining 20% & the 99% gaining 1%. The richest 1% of adults owned 40% of global assets in 2000. The three richest people in the world possess more financial assets than the lowest 48 nations combined. The combined wealth of the “10 million dollar millionaires” grew to nearly $41 trillion in 2008. In 2014, the 85 wealthiest individuals in the world have a combined wealth equal to the wealth of the bottom 50% of the world’s population or about 3.5 billion people. The wealthiest 1% owns 46% of the world’s wealth. –You get the picture, I am sure. In terms of American history, the first recorded era of inequality came after the Civil War in 1865 with industrialization, dubbed both “the Industrial Revolution” and “the Gilded Age.” This continued gain by the wealthy in income lasted until 1937, despite Teddy Roosevelt’s “trust busting,” Woodrow Wilson’s 1913 income tax, and the infamous Stock Market Crash of 1929. Between 1937 and 1947 income inequality in America fell dramatically in favor of the middle class. New Deal programs, unions, and World War II legislation like the GI Bill raised the income of the poor & working class and lowered the incomes at the top. This low level inequality of the broad middle class remained steady for three decades due to high wages and government policies that had a leveling effect on incomes such as the progressive income tax. But we now know that the early 1970’s began the march back to higher inequality between the rich and the masses. Some of you may recall the Reagan tax cut of 1981, famously cutting the top rate from 70% to 50% over three years. Income grew unequally almost continuously during this period until our present 2014 (with the exceptions of the recessions of 1990, 2001, and 2007). With that inadequate history lesson (there being so much more to our story than the above overview), maybe we can make good on Ben Franklin’s challenge to keep our republic. Here is what prominent sources are saying. 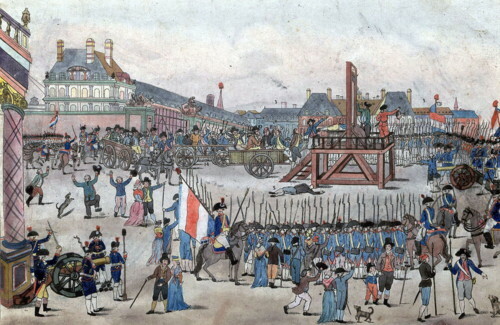 The execution of Robespierre, leader of the French Revolution, by guillotine, July 28, 1794, ending the Reign of Terror during which the wealthy nobility were similarly executed. The author’s not so subtle point, Catherine Rampbell in the following article, is that it is better for the rich to participate in the formation of policies geared to lift up the lower classes. Catherine Rampbell’s article documents how Americans’ tolerance for income inequality depends on their own household opportunity to earn more. As proof, she cites the growth of inequality by the year 2000 and, yet, objections to inequality were shrinking. As long as people felt they had a good chance of improving their standard of living, they could tolerate “the rich getting richer,” so the data confirmed. Rampbell then goes on to say that by the Great Recession of 2008 hostility over inequality rebounded. The perception was that the rich were getting richer and that everyone else was being left behind. Her most poignant comment reflecting on her data was that “if the 0.1 percent want to be left alone – or at least not be pursued by pitchforks and guillotines – they should probably support policies that promote the upward mobility of other Americans.” Here she gives examples of such programs from early childhood education to raising the minimum wage. And, she reassures that while these policies would raise taxes, improving mobility and raising living standards of average Americans would not hinder the rich from getting richer! Thomas Piketty’s new book, published originally in 2013, focuses on wealth & income inequality in Europe & the U.S. since the 18th century. Thomas Piketty, age 43, French economist, Paris School of Economics, & author of Capital in the Twenty-First Century, 2013. Harold Meyerson’s article is all about the latest sensation in economic and political circles. 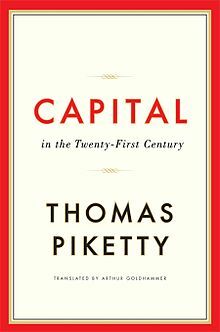 It is Thomas Piketty’s book, Capitalism in the Twenty-First Century. 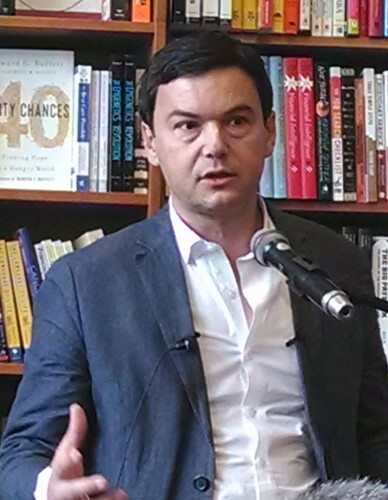 Piketty, a French economist at the Paris School of Economics, wrote the book assisted by Emmanuel Saez, an economist at the University of California at Berkley. The book was published in French in August 2013 and in English in April 2014. It reached number one on the New York Times bestseller list by May and is already being acclaimed as “the most important work in economics since John Maynard Keynes’ General Theory.” Piketty has already met this year with President Obama’s Council of Economic Advisers. Piketty, with Saez’s assistance, looked at tax records in Britain and France over the past 250 years. They also researched income distribution for the last hundred years in every major capitalist nation. Central to the book’s conclusion is the author’s theory that in most times the interest on capital (r) (i.e., investments and ownership) accumulates at a higher rate than the overall economy (g) is growing. (Read that again! It’s really very simple! r > g … meaning profits, dividends, interest, rents, and other income from the capital of the wealthy are greater than growth from people’s income/labor/output. ) This leads Piketty to the central thesis of his book; inequality of wealth is not an accident, but rather a feature of capitalism, and can only be reversed through government intervention/policies/legislation. The book acknowledges that the accumulation of wealth took a setback between 1930 and 1975 due to the affect of two World Wars and the Great Depression. New Deal reforms in the U.S. and social democratic programs in Europe boosted workers incomes and the rise of the middle class. But since 1980, fortunes flourished at everyone else’s expense. Ronald Reagan and Margaret Thatcher cut taxes on the wealthy. Workers lost ground negotiating at the bargaining table for wages. And population growth has slowed to nearly half. With this wealth, Piketty adds, comes political power — plutocracy — heightened by the 2014 Supreme Court decision in McCutcheon vs. Federal Elections Commission, permitting the wealthy to contribute to as many campaigns as they wish, removing the overall cap on individual contributions. Piketty argues that if capitalism is not reformed, our “democratic order will be threatened.” – – Now that’s an eye-opener! So, what does Piketty propose? Harold Meyerson’s article summarizes: Piketty suggests that an annual global wealth tax of up to 2 %, utopian Piketty admits, combined with a progressive income tax reaching as high as 80%, would reduce inequality. And, more easily achievable, workers must be empowered again at the bargaining table and goods and services increased. – – All-together quite a tall order and radical to say the least. But I’m sure the Democrats and Republicans in the Congress could work something out! And the Republicans’ Tea Party will just love this! – – Don’t hold your breath! Excuse us for living, but old Ben Franklin never said this would be easy! Another excellent written piece Phil! This whole article reads like a history lesson with sparkles of today. Ah Phil, a late July post with such a relevant universal theme. Our society is at a critical point. Currency devaluations. Real property laws that again work against the masses. ie. Property taxes in NJ favor the super rich. Location, Location,location. Land and resources always have had value.The ghettos are in sight of many state houses. We are the products of a brief but wonderful era to elevate the common man. The fight will go on. Keep in mind we should continue to be givers. Your insights are spot on. Enjoy August, the weather in Mass has been for the most part awesome. God Bless. Love to all. The only thing that I take issue with is the “80%” progressive income tax on the wealthiest. What would be the incentive for the wealthy to keep striving, inventing, providing work for the workforce? I don’t know any of these people-but I would ask them this question: Would you continue doing what you are doing, if you faced with “fines” this high? No one is stopping others from attaining any type of money-becoming the next Bill Gates. Speaking of Gates-He and his wife Melinda have the Gates Foundation…without this Foundation, the money he gives out would not go to the entities that needed it-it would go to who knows where as taxes. At least Gates and his wife have a say in where their money goes to. I find it interesting that some of the comments worry about the welfare of the super rich if their taxes were increased and whether they would continue working and generating wealth. Of course they would continue. It is in their blood to accumulate. Else why would Gates and Buffet still be doing their thing? I also think they have used the wrong example. The Koch brothers don’t give a damn about American workers except as a mean to an end. They have long been the “champions” of eliminating Social Security, of doing away with organized labor, of paying zero taxes. I, also, am a member of the 1%. Unfortunately the 1% I belong to is on the bottom of the heap – not the top. Every month I have to count pennies to make sure I am paying my bills and have enough to eat. It is difficult to not think of getting out the pitchforks when I read that the Koch brothers each increases his wealth by more than a million dollars everyday. They are of the wealthiest but also of the greediest and stingiest families. It would bring a big smile to my face to see their empire absolutely demolished. Life would go on, life would be fairer for all and, I must admit, I would take great pleasure in their downfall. Note that I am speaking specifically about the Koch brothers. In the end, wealth and how it is accumulated must have a major shake-up. And it needs to happen soon. It is obvious that Congress is too concerned about getting re-elected to rock any boats. But if they won’t act, then it becomes incumbent on the people to act in any way they can. Phil, This is an article from “Daily Kos”. Seems I might be right – the answer may (need to be) pitchforks instead of civilized compromise. This is a terrific post Phil on a topic that is very important to me. I know that I’m a little late to this party, but I thought I would add how amazing I find it that those individuals that are most against greater income equality are those that it would most help. By increasing the incomes of the middle class and the poor the 1% would be increasing the audience that would be most likely to purchase their goods and services. Isn’t this a win-win for everyone. I remember a time, as I’m sure you do, when this level of division did not exist. How I would love to return to those days. Keep up the great work. Phil, informative and well organized and explained…however I was hoping I had more options to effect change than a pitchfork…I guess I already knew the truth though. It is all too true that the relatively wealthy (like Jim above) still struggle to maintain their modest wealth. It seems upside down. I would not be in favor of redistribution but I am in favor of the very wealthiest individuals bearing and appropriate part of the burden in regards to taxes. Often the very wealthiest find an overly exorbadent number of ways to reduce their taxable income considerably. Matilda the Techie Genius!!! OK, experiment! Can I reply to the last comment even though there is no “reply” to click on? I bet “yes”! Let’s see & stupid me how this works out!!! Phil ———-Ha! I am the techie fool!!!!!!!!! I think income inequality is going to be the defining factor in the death of the United States, and possibly the start (if it has not already started) the beginning of World War III. When climate change becomes so severe that places like San Diego and Los Angeles have no water for the masses because the richest 1% are controlling what is left, it’s going to get bad. The small and humble among us are being herded into a closet.